The history of the Iroha Yokocho began after the end of the war. Thereafter, 70 years passed. The cityscape of Sendai still keeps a strong atmosphere of the Showa while it has changed. Let us introduce the history that people and customers of the Yokocho has walked together as they inherit the good old times. Stalls of Sendai station square and Ichibancho begun to be alive quickly in the downtown that many things were lost and became the burnt field. Shoppers gathered in the stalls where the china laid in the storehouse or the unburned clogs were displayed on the doors and the straw mats spread on the roadside. Citizen’s new life started. Eventually, the movement of people who worked on stallholders to found a market began to appear. 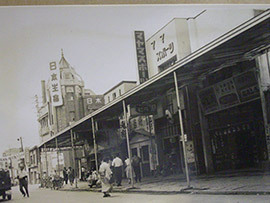 In August, 1946, “the central public market”, the forerunner of the current Iroha Yokocho, was born. The prewar land lease right holders, the repatriates from the battle front and people burnt out by the air raid opened their shops and accomplished recovery first in Sendai for the postwar confusion period. The population of Sendai City increased rapidly since people returned from the battle front or the evacuation and people evacuated again from the big city. The central public market was always crowded with the customers who bought daily necessities, and all shops worked hard from morning to midnight. There is an episode that a former soldier who was in a high position until just recently opened a fish store and he went out to lay in stock many times a day to Shiogama and sold fishes. Neighborhood was lined with movie theaters, and there were various events to be held on a stage of the vacant land. It was crowded as a bustling shopping and entertainment district with everything from everyday shopping to entertainment. When the central public market opened, the two passages which linked the Nankoin-dori to the Ichibancho-dori had the names. “The Aoba-koji” on the Aoba-dori side was lined with shops selling products including clothing and miscellaneous goods, and “the Shochiku-koji” on the Minamicho-dori side was lined with grocery stores and restaurants. 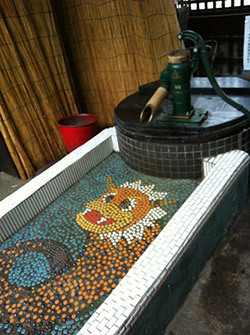 However, the types of business gradually joined for years, and the present Iroha Yokocho were formed. Copyright © the Iroha Yokocho All Rights Reserved.